“We started with a concept”, could be read in the album cover of the seminal band Earth. The spanish trio Orthodox could say the same. Their music, their performance, their artwork, everything is made in order to develop their own concept. The band started in the winter of 2004/05 and the next April they recorded the two themes of "Gran Poder", an amazing debut that is just the first stone of the sonic monolith they´re going to build step by step. In this first recording, their musical influences (Black Sabbath, Pink Floyd, Melvins, Sleep...) get mixed with their peculiar perception of the south-spanish religious folklore. The result is a liturgic music with obsesive repetitions, minimalism, feedback, distortion and endless drones creating a primitive feeling that leads to trance and remains as a perfect soundtrack for every dark point of christianism: opression, sin, suffering, guilt and pain. 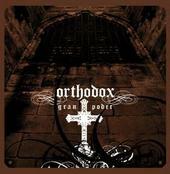 Orthodox members come from diferent bands of the spanish underground (Tierra, Degüello, The Forge... ) but is Orthodox the band where they feel free to express theirselves and let their personalities sing with a same voice. Now they´re working in new songs with new instrumentation (stand up bass, piano...) and showing influences from John Coltrane, Ornette Coleman, Morricone, Ligeti and religious music so they can express their spiritually in the heaviest way possible.